The UV254 project is part-financed by the European Regional Development Fund under the EU Investment for Growth and Jobs Programme for Northern Ireland 2014-2020. UV254 Go! is a portable UV254 analyser that enables measurement at different points within the treatment process. It is as well suited to measurements at the river side as it is to measuring a sample in the laboratory. Simply place the cuvette into the Go! press measure and receive your UV254 and surrogate measurements of TOC, DOC, BOD, COD etc. Every measurement is stored for review and data export. The UV254 probe continuously measures water in real time. This can be done by either taking a side stream to a flow cell, or by fitting it to a T-piece inline, or immersing it in an open channel. For applications such as waste water, the measurement optical component is kept clean via ultrasonic cleaning. The probe can be configured to be made from either stainless steel, aluminium or plastic. The Photonic Measurements UV254 Display Monitor allows real time measurements of UV254 and surrogate measurements to be displayed and trended over time. The daylight readable touchscreen makes navigation of menus intuitive. Display a number of surrogate measurements such as TOC, COD and DOC as well UVT and UVA. 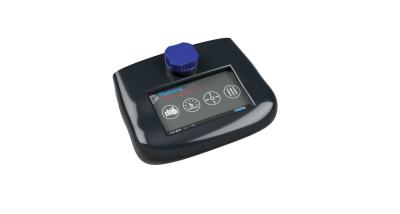 Calibrate and verify surrogate measurements with a simple guided screen process. For hand held application the dip probe is connected to the Photonic Measurements portable display unit. Which has all the same application software as the UV254 Go. For fixed operation the dip probe can be configured with the probe display unit. In both configurations all data is logged for surrogate measurements (for example TOC, BOD and COD) as well as UVT and UVA. Dip probe comes with a light shield to remove negative effects of ambient light on the measurement. The probe can be configured on order to have either a 20 or 50mm path length to suit your application needs.